German Aircraft of WWII: Arado Ar 234B-2 "Nachtigall"
This particular aircraft (WNr 140146) was flown by Hauptmann Kurt Bonow based in Oranienburg during March 1945. It seems that during the last weeks of the War he managed to engage some RAF Mosquito night fighters although he failed to down any of them. Some references mention that a cramped radar compartment in the aft fuselage section (that normally contained aerial cameras) hosted a radar operator to help to zero on enemy aircraft. The Ar 234 was also flown by Kommando Bonow, an experiment night-fighter unit which operated until the end of the war under the control of Luftflotte Reich. On 11 November 1944, a test command under Hauptmann Bisign was established. Production was ordered to begin again. On 23 February 1945, Hauptman Bising and his radar operator have an accident on takeoff. On 26, March 1945, Hauptman Kurt Bonow, from Kommando 288, take command of the unit that was to be re-designated Erprobungskommando Bonow, based in Oranienburg. Bonow flew Wrk.Nr. 140146 plane. In the winter 1944-45 a single-seat Ar 234 B-1 was also converted and tested for night fighter rôle operating with Bonow's Kommando. This plane was also armed with a WB weapon holder holding two MG 151 20 mm guns. This plane was successful for its pilot, a Oberfeldwebel, because it shot down in several occasions R.A.F. four powered bombers." "It is also known from photographic records that the prototype V-15 (Wrk.Nr. 130015 PH+SY) -originally used to test a configuration of four BMW 003A-1engine engines- was converted to Ar 234B-2/N standards and re-powered with Jumo 109-004B-1. This plane was the mount of Kap. Bisping from EKD N 234 during the last months of the conflict. That plane kept its original day-time camouflage scheme in colors RLM 70/65." 3./Versuchsverband OKL, Oranienburg - Berlin 1945. Kommando Bonow, Oranienburg - Berlin 1945. Formed 11.44 in Oranienburg as Sonderkommando Bisping, with Ar 234B, as an experimental nightfighter unit. It is not known if the unit operated any aircraft before 2.45. The only jet-night-fighter unit was 10/NJG 11 (Kdo Welter) with max.12 Me 262 B-2 in 4-5/ 45. The Kdo Bonow had 3 (known) Ar 234 B-2 NF for trial in 3-4/ 45. Raised from Sd Kdo. Bisping in March 1945 following the death of Hauptmann Josef Bisping. Bonow was the commander and sole operational pilot of the unit which flew two converted Ar 234B-2s. These aircraft had nose mounted radar and a belly pack containing two MG151/20 cannon. This unit was controlled by Luflotte Reich. On 12.12.1944, the Oberkommando der Luftwaffe organised the establishment of two jet nightfighter Kommandos at Oranienburg – Welter (Me 262) and Bisping (Ar 234). The intention was that Lt Kurt Welter’s command would be equipped with three Me 262s and that of Hptm. Joseph Bisping should also have an equal complement of Ar 234 nightfighters. Raised as an experimental nightfighter unit in late 1944 using the Ar 234B, after Kurt Welter had tested both the Ar 234 and the Me 262 and recommended that the Ar 234 was not suitable for nightfighting. IBetween the 11th and 17th of December 1944 two flights in Ar 234B-2/N 140145 took place to test onboard systems. This machine is not reported again until another flight of barely 15 minutes duration followed in the middle of January 1945. Commanded by Hauptmann Josef Bisping until his death in a take-off accident on 13 Feb 1945. In the bomber version of the Ar234 B-2 the periscope housed also a PV1B shallow-dive-attack sighting head. In 1945, during the last weeks of the war, a handful of Ar234 B "Blitz" modified bombers were operative for the night defense rÃ´le in the Berlin area. It was the Arado 234 B-2/N Nachtigall (nightingale). On July 1944, Arado worked on the development of Ar234 as a two-seater night fighter. Arado received the order to produce 30 planes at first. The design placed a second crew radar operator in the rear fuselage. On 20 September 1944, at Warneuchen and Oranienburg, began the conversion of the first Ar234 B-2/N. It was reequipped with FuG216 Neptun V or FuG 218 radar system and aerials, and the WB 151 weapon holder, known as "Magirus Bombe, placed on the central bomb bay of the aeroplane holding two 20 mm MG151 with 200 r.p.g each. RLM stopped the reequipping to deliver the jet bomber version for the units of KG 76 which desperately needed reinforcements. It is also known from photographic records that the prototype V-15 (Wrk.Nr. 130015 PH+SY) -originally used to test a configuration of four BMW 003A-1engine engines- was converted to Ar234B-2/N standards and re-powered with Jumo109-004B-1. This plane was the mount of Kap. Bisping from EKD N 234 during the last months of the conflict. That plane kept its original day-time camouflage scheme in colors RLM 70/65. On 11 November 1944, a test command under Hauptmann Bisign was established. Production was ordered to begin again. On 23 February 1945, Hauptman Bising and his radar operator have an accident on takeoff. On 26, March 1945, Hauptman Kurt Bonow, from Kommando 288, take command of the unit that was to be re-designated Erprobungskommando Bonow, based in Oranienburg. Bonow flew Wrk.Nr. 140146 plane. In the winter 1944-45 a single-seat Ar234 B-1 was also converted and tested for night fighter operating with Bonow's Kommando. This plane was also armed with a WB weapon holder holding two MG151 20 mm guns. This plane was successful for its pilot, a Oberfeldwebel, because it shot down in several occasions R.A.F. four powered bombers. Other projects parallel to the Nachtigall were the Ar234 C-3N and C-7, scheduled for mid-'45 as high performance fighters and night-fighters in many configurations armed with two extra forward-firing MG151 mounted in the nose. The P-1 to P-5 series were to be develop for the series night fighter production. The P night fighter featured a better armament with a more aerodynamic weapon holder in the belly, two nose-mounted MG151 and Schräge Musik on the back. A Bremen radar plate would be mounted in the nose. P-series projects were powered by Hirth-Heinkel HeS 011 engines. 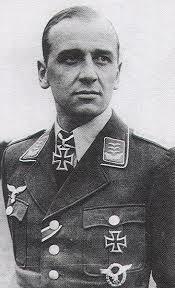 Werner Streib By the end of war 65 was his final score of victories. Arado Ar 234B-2/N V15 WrkNr.140146 SM+FF flown with Ofw. Marchetti for Kommando Bonow, Oranienburg - Berlin 1945. Proposed two-seat night-fighter with two forward firing 20 mm MG 151/20 and two 30 mm MK 108 cannon, using FuG 218 Neptun V radar. Night fighter similar to C-3/N, but with crew side-by-side and enhanced FuG 245 Bremen 0 centimetric radar. Powerplant: (B Series) Two 1,984 lbs (900 kW / 8.825 kN) thrust Junkers Jumo 109-004B-1/2/3 Orkan axial flow turbojet engines and provision for two 1,102 lbs (822 kW / 4.90 kN) Walter HWK 109-500 (R1-202b) RATO units with a 30 second burn duration. (C Series) Four 1,764 lbs (800 kg / 7.85 kN) thrust BMW 109-003A-1 turbojet engines in paired nacelles. Performance: (B Series) Maximum speed (clean) 461 mph (742 km/h) at 19,685 ft (6000 m); service ceiling 32,820 ft (10000 m); climb to service ceiling in 12 minutes 48 seconds with a 1,102 lbs (500 kg) bomb load or 17 minutes 30 seconds with a 3,307 lbs (1500 kg) bomb load. (C Series) Maximum speed (clean) 531 mph (855 km/h) at 19,685 ft (6000 m); service ceiling 36,090 ft (11000 m). Range: (B Series) Clean 1013 miles (1630 km) or 684 miles (1100 km) with 3,307 lbs (1500 kg) of bombs. (C Series) 765 miles (1230 km) with a 4,409 lbs (2000 kg) of bombs. Weight: (B Series) Empty equipped 11,464 lbs (5200 kg) with a maximum take-off weight of 21,715 lbs (9850 kg). (C Series) Empty equipped 11,464 lbs (5200 kg) with a maximum take-off weight of 24,250 lbs (11000 kg). Dimensions: Span 46 ft 3 1/2 in (14.11 m); length 41 ft 5 1/2 in (12.64 m); height 14 ft 1 1/4 in (4.30 m); wing area 284.18 sq ft (26.40 sq m). Armament: (B-1) unarmed reconnaissance version. (B-2) Two fixed MG 151/20 20 mm cannon in rear fuselage, firing to rear and sighted by periscope and various combinations of bombs slung under fuselage and/or engine nacelles up to 3,307 lbs (1500 kg) using ETC 503 bomb racks. (C-3) Same as B Series but with the addition of two MG 151/20 20 mm cannon under the nose. (C-3/N) Two forward firing MG 151/20 20 mm cannon and two MK 108 30 mm cannon. Variants: E.370 (initial design project), Ar 234V-1/2/3, V-9 (initial design prototypes), Ar 234B-0 (20 examples used for evaluation), Ar 234B-1 (reconnaissance), Ar 234B-2 (bomber), Ar 234C (four engine version), Ar 234C-1/2/3/4/5/6/7/8, Ar 234D, Ar 234D-1/2, Ar 234P, Ar 234P-1/2/3/4/5. History: First flight (Ar 234V-1) 15 June 1943, (Ar 234V-9 with landing gear) March 1944, (Ar 234B-0 pre-production) 8 June 1944, operational delivery September 1944.